The white wine produced by Micu Narunsky Wines portfolio was previously made from the Muscat de Frontignan grape variety. Named La Complicité, the first vintage was made in 2005 while Micu worked as an intern at L'Avenir wine estate in Stellenbsoch. Being a dry white wine made from a variety usually associated with sweet wines, La Complicité was the only wine of its kind in South Africa. A favourite in such restaurants as Aubergine in Cape Town, La Colombe in Constantia and Grande Roche in Paarl, it was known as the 'Asparagus wine' due to its perfect pairing with this delicate seasonal vegetable. The wine was made in 2005, 2006 and 2008, years that allowed for optimum ripeness of the grapes. As from the 2011 vintage, La Complicité is made from the Colombard grape variety. 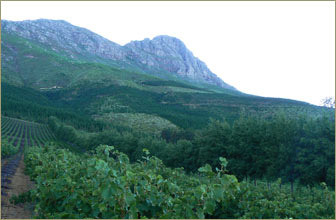 The reason for the shift from one variety to the other is the fact that Muscat de Frontignan viticulture in South Africa is usually geared for the beverage known as Muscadel (Fortified grape juice). The viticulture necessary for the production of high quality dry white wine requires much lower yields than those for Muscadel, and as a 'no compromises' winemaking operation, the attention shifted to a variety that can be cultivated in the manner suitable for high quality wine. Colombard is abundant in the South African winelands, a fact that allowed Micu to find a 'perfect spot' from which to source grapes. Made on an experimental basis in 2011, the experiment was deemed a success and the new version of La Complicité is released in November 2012. Please go to the La Complicité page for more details.